Q: What on earth does 'Bieh' mean and how do you say it? 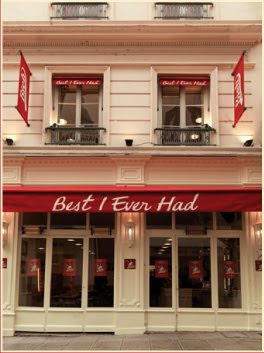 A: It stands for 'Best I Ever Had' and is pronounced 'bee-aye'. Q: How long has Bieh been in Lyon? Q: Is it true they serve a bacon cheddar cheeseburger with real bacon, real cheddar and a real beef patty larger than a Prince cookie? A: You betcha'. 180 grams = just over 6 oz. And a dill pickle to boot. Q: Oh wait - is it ridiculously expensive? A: Nope. 8-13,50€ for burgers, 5-7€ for hot sandwiches, 5,50-9,50€ for salads, and 4-6€ for desserts. We went today! The place seemed popular and filled up quickly for lunch. The food was good. We told the host about this article, and the chef came out and said hello to us. Very good experience. 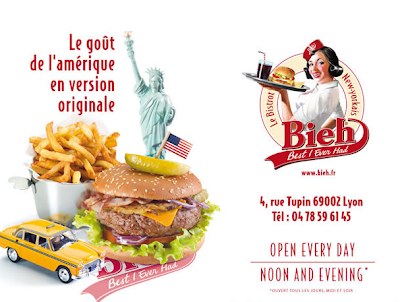 It is pricey for the US, but for a good burger in Lyon - I'd say not too bad! Really Cool place in Lyon, the Food is good and the Staff super Nice !!! !